PhoenixMotorsport have over 30 years experience in motorsport engine preparation from mildly tuned performance road engines to wild, ultra high compression normally aspirated and high boost forced induction drag race motors. 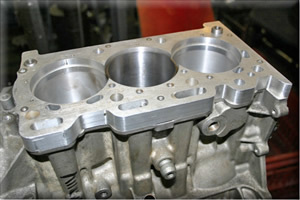 With the advent of the mass produced turbocharged road cars such as the Ford Sierra Cosworth and RS Turbo, the multi valve engines of the late 1980’s and the latest ECU controlled engine management systems, PhoenixMotorsport have been involved from the beginning of the latest generation of high performance vehicles. 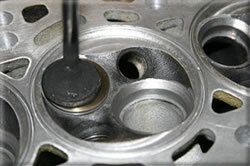 Our engine preparation facilities include valve guide and seat installation, seat cutting, port throat machining, cylinder head crack and pressure testing, refacing, chambering, boring, honing, block “O” ringing, liner installation, crank grinding and many more engineering tasks as well as engine assembly, both full and partial (head only or block only). With the arrival over the last few years of the disposable engine, where it is almost always cheaper to replace an engine than repair it, (even a failed head gasket can often write-off some engines! ), there has been a dramatic loss of engine machine shops, but we are proud to be able to offer these “old school” facilities, manned by engineers with over 80 years combined experience between the two of them. With the huge upsurge of performance diesels now entering the market place, and the demand for petrol performance and beyond from these diesels, re-programming (chipping) of the ECU has become very popular on these vehicles, with substantial power and torque gains available. This is another service available from us, both for diesels and ECU controlled petrol engined vehicles.